Home / Sports / Monaco In Champions League Semi-finals 13yrs After. Monaco In Champions League Semi-finals 13yrs After. Monaco reached the Champions League semi-finals for the first time since 2004 after an impressive second-leg performance in the last eight against Borussia Dortmund on Wednesday. The Ligue 1 side took a 3-2 first-leg lead back to Stade Louis II, where kick-off was pushed back five minutes after Dortmund's team bus was delayed. Teenager Kylian Mbappe pounced from close range to increase Monaco's advantage after three minutes and Radamel Falcao headed in soon after to all but put the tie beyond Dortmund. The Bundesliga outfit threw on exciting forward Ousmane Dembele and it was a fantastic run from the 19-year-old that set up Marco Reus to lash in after the break. But substitute Valere Germain scored 21 seconds after coming off the bench for the hosts to secure their spot in the last four. 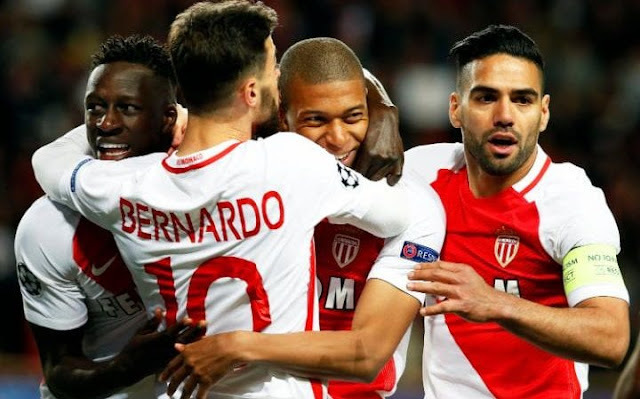 Monaco will discover their semi-final opponents when the draw is made on Friday, with Real Madrid, Atletico Madrid and Juventus also progressing.